The Salt March, also known as the Salt Satyagrahah began with the Dandi March on March 12, 1930, and was an important part of the Indian independence movement. It was a campaign of tax resistance and nonviolent protest against the British salt monopoly in colonial India, and triggered the wider Civil Disobedience Movement. This was the most significant organized challenge to British authority since the Non-cooperation movement of 1920–22, and directly followed the Purna Swaraj declaration of independence by the Indian National Congress on January 26, 1930. 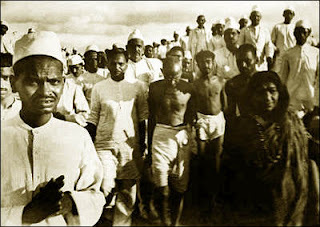 Mahatma Gandhi led the Dandi march from his base, Sabarmati Ashram, Ahmedabad, to the sea coast near the village of Dandi. 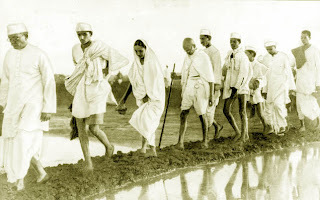 As he continued on this 24 day, 240 mile (390 km) march to produce salt without paying the tax, growing numbers of Indians joined him along the way. When Gandhi broke the salt laws at 6:30 am on April 6, 1930, it sparked large scale acts of civil disobedience against the British Raj salt laws by millions of Indians. The campaign had a significant effect on changing world and British attitudes toward Indian independenceand caused large numbers of Indians to join the fight for the first time. The first day's march of 21 kilometres ended in the village of Aslali, where Gandhiji spoke to a crowd of about 4,000. As they entered each village, crowds greeted the marchers, beating drums and cymbals. Gandhiji gave speeches attacking the salt tax as inhuman, and the salt satyagraha as a "poor man's battle." Each night they slept in the open, asking of the villagers nothing more than simple food and a place to rest and wash. Gandhi felt that this would bring the poor into the battle for independence, necessary for eventual victory. 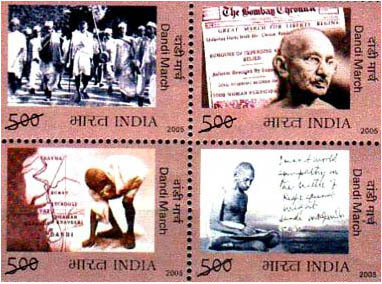 Special commemorative stamps have been issued by India Post to commemorate this historical Dandi March. A set of two se-tenant stamps was issued on 2 October 1980. 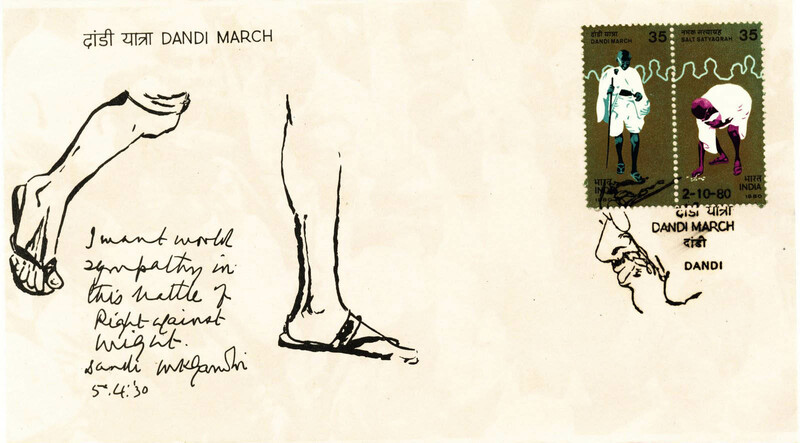 To mark the 75th Anniversary of Dandhi March, a set of four commemorative stamps was also issued on 5th April 2005. Special covers and other philatelic material is also available on this subject. 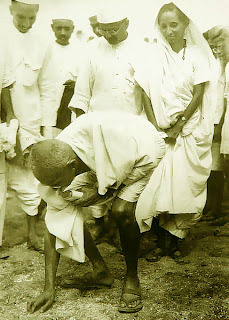 On the occasion of Gujarat Philatelic Exhibition, Gujpex 2011, which is being held at Vadodara, from 23rd to 25th December 2011, a set of 22 special used picture postcards is being released to commemorate the historic Dandi March. 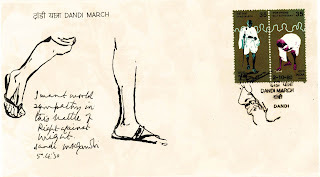 These special post cards shall be posted at Ashram Road Post Office, Ahmedabad and at 21 other locations along the route of Dandi March, wherever Mahatma Gandhi halted for the night and from where he resumed his march the next morning. All these post cards will addressed to Secretary, Gujpex 2011, c/o Postmaster, Dandi and shall be transmitted by normal postal channel to Dandi and delivered to the addressee. Only 500 post cards shall be posted at each of the 22 locations and these post cards shall be serially numbered from 1 to 500. On delivery at Dandi, the postcards shall be arranged in 500 sets, each containing of 22 post cards of same number but posted at 22 different locations on the route as stated above. These post cards shall bear the cancellation of offices of posting and delivery stamp of Dandi Post Office. Each such set shall be placed in a Khadi pouch along with a Certificate of Authenticity signed by an appropriate Postal Authority. Of the 500 sets of picture postcards so issued and arranged, only 450 sets shall be available for sale, each at a price of Rs. 1000/- only. However, first 100 pre-bookings will be provided at 30% discount, i.e. for Rs. 700/- only and remaining pre-bookings at 15% discount, i.e. for Rs. 850/- only. These shall also be available on sale at the venue of exhibition at a discount of 15%, i.e. for Rs. 850/- only. Interested philatelists and collectors are advised to send their requests for pre-bookings and the requisite amount to Director, Postal Training Centre, Vadodara, by i-MO or e-MO with full contact details. The booking can also be made in person by paying in cash. If the amount is being sent by i-MO or e-MO then the amount may be sent presuming 15% discount. If the pre-booking order qualifies for the 30% discount as stated above, the remaining amount shall be refunded later. Pre-bookings shall be accepted upto 21st December 2011. The receipt of i-MO or e-MO in original and photo identification is necessary to personally collect the booked set from the venue of the exhibition. If the booked set is not collected personally, then the same will be sent by insured post. Information based on the press note received from Gujpex 2011 Secretariat, O/o Postmaster General, Vadodara Region, Vadodara – 390002 dated 9th December 2011. I think your cover from ICSC Phnom Penh dated 24-6-56 was from FPO 745, not 746. Really interesting stamps ‘posted’ on here. I hope that they got there with 1st class delivery, whatever that may cost in their native country or at whatever moment in time. If you are ready to venture forth here is another stamp collector’s paradise!